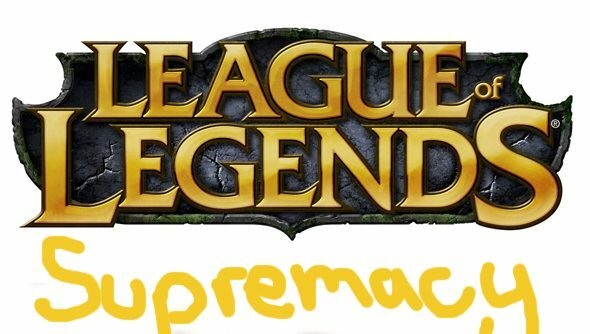 What is League of Legends: Supremacy? In the middle of last week, Riot filed a trademark for something called ‘League of Legends: Supremacy’, and they did it quietly. Without a lot of fuss. Incognito, you might say. You could even infer they sneaked into the trademark office in an overcoat and a fedora, with some thick sunglasses, before looking left and right, then throwing the papers across the room and running out in a panic. You might, but that would be a bit silly, what with ‘Riot Games, Inc.’ all over the trademark forms. But still, it could have happened. The interesting part is that you have to provide a few reasons for why you want a trademark when you file it. And while Riot might have thought they could get us off the scent with reasons like nautical (Nautilus? ), magnetic data carriers (Viktor? ), fire-extinguishing apparatus (Firefighter Tristana?) or automatic vending machines (er…Blitzcrank? ), there’s still enough meat in there for us to have a good old chew. And here’s the post-chewn mouthful that we’ve come up with. The first major clue is in the name, as it follows on from League of Legends: Dominion, and as such, it might be tempting to call it a new game mode. And if that’s the case, it’s most likely to take the shape of ARAM, the mode that is currently available to play in custom games, and takes a modified version of the proving grounds tutorial map and has everyone rush down a single lane to duke it out in teamfights from the getgo. However, the way that the description is worded makes it sound less like a game mode and more like something… else. Halfway down the page on the trademark is a category all on its own, described as ‘Education; providing of training; entertainment; sporting and cultural activities.’, which seems like an odd thing to set aside unless it’s going to be relevant, in which case it wouldn’t be a huge leap to think that maybe Riot are thinking about how to get players into the game easier. If you throw in the other descriptions found higher up on the page, they might be going for something that is less a step-by-step in-game guide and more like the Mentor system that Valve have hinted at for Dota 2. By incentivising players to help one another learn the game, you’ll also have them thinking about how the game is played, which should make them better players too. It’s a bit of a win win. There’s much less evidence for this one, beyond what the title hints at, but the idea of having daily, regular tournments that players could enter with a few of their friends, and not have to be a pro gamer to compete in, is certainly a smart one, and something that would make sense within League of Legends. Maybe a knockout of eight teams, meaning three games maximum, would work, with increased IP rewards the higher you get, or even heading up to sixteen for four games. It’s not a huge commitment for the dedicated players, and would provide some good structure to otherwise isolated games. Much in the same vein as Battlelog, a lot of the descriptions in the trademark hint at stat tracking, friends lists, and the works being integrated into a website in addition to the launcher. With their recent additions and rework of the spectator system, it wouldn’t be too much of a leap to think that Riot might want to provide the community with more tools to interact with one another, and the game itself. But still, there’s one more option, and it’s the most drastic of them all. Dropping Adobe Air and making something totally new, involving any and all of the suggestions above. It would be a huge step forward for LoL, and would get rid of the constantly ailing software that is clunky at best, and downright doesn’t work at its worst. In many ways Riot have been a victim of their own success, and it’s kind of amazing that the launcher client even holds up under the pressure it’s constantly put under, but still, enough is enough, and it’s time to upgrade. It’s unlikely that we’re going to hear anything in the very near future though, as trademarks tend to be grabbed as soon as a name is settled on, rather than just before a big announcement, but still, PAX Prime is just around the corner, and LoL has typically always announced something big there. Either way, it’s going to be interesting what the next big step for League of Legend’s constant huge success is going to be.